How far is the campsite off the main road, along the dirt, and what is the condition of the off road? Only 7kms of good surface road which is well maintained and easily passable by all vehicles as well as caravans. ONLY FOLLOW THE MARKED/SIGNPOSTED ROAD AS UNMARKED ROAD FROM WAYBRIDGE TURNOFF IS IMPASSABLE! UNMARKED ROAD IS IMPASSABLE – do not follow your own GPS here. Preferably rely on Tracks4Africa maps and link not own GPS!! We do not have a restaurant as yet BUT we do have delicious homemade meals—MIKE’S MEALS. What game are we likely to see? 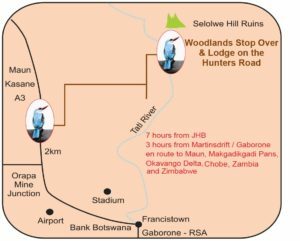 We are not within a game reserve but animals that are frequently sighted and heard are:- Kudu, Impala, Duiker, Steenbok, Jackal and Monkeys. What is the bird life like? Excellent! An ornithologist’s paradise! A large variety of Botswana birds species can be sighted particularly during the dry season when they come to the water supply. The migrant Woodland Kingfisher returns annually to nest on the beautiful banks of the Tati River. Since the construction of our own dam and Ntimbale State dam upstream we have seen increase water fowl as they use the Tati River as a flight path.